The passage of time becomes more apparent when your children’s peers and their siblings begin to wed. Ouch. Admittedly there is a slight sting to getting older, but on the other hand, we have a wedding to celebrate! Weddings and baptisms are such sunny, exhilarating events. They are celebrations filled with the promise of hope and jubilation; of all-consuming love for another living soul and the unspoken word of honor, vow, that all gathered have pledged to others in their lifetimes. Big wedding, small wedding it matters not. They are all lovely and joyous. 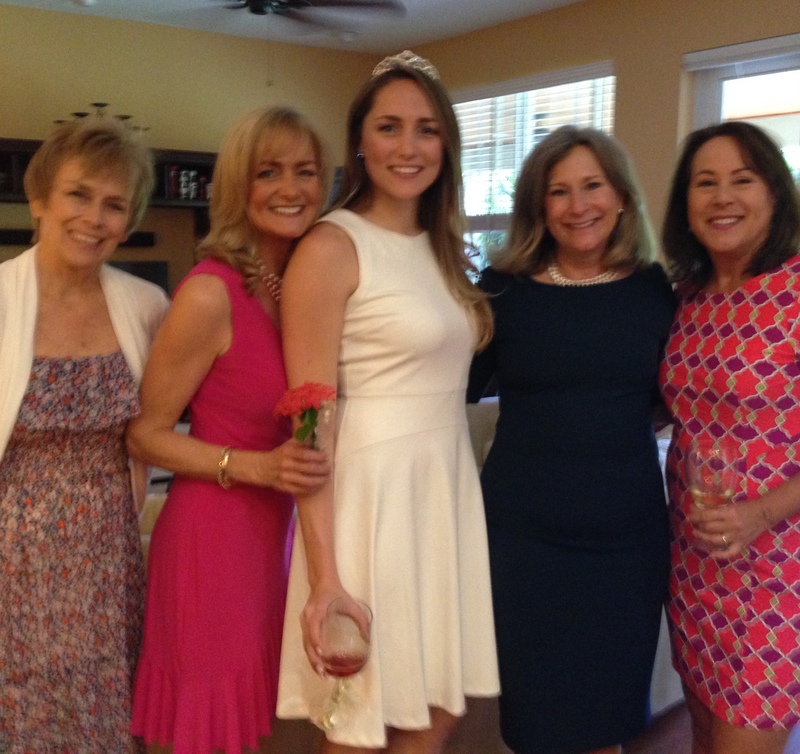 This past weekend I took part in a wedding shower for a young lady who grew up in our neighborhood and went to the same schools as our son, James. Katie’s’ brother was in James’ class beginning in Pre-K through high school. Pre-K is where this group of students’ mothers met and forged a bond that, through the years, has withstood the tragedy of drugs, financial ruin and even death. There were four core families, all Catholic with working mothers and fathers and more kids than you’d care to count. We lived within a one mile radius of each other. The boys all played T-ball up to high school together and the teams were coached by the fathers. What a time we had! As parents we learned to prepare snacks for the kids AND hors d’oeuvre for the grownups. Hot? Sweet baby Jesus, but it was hot at that ball park. We started bringing our cocktails in insulated coffee mugs then graduated to large beverage coolers filled with OUR version of jungle juice, hooch, grain punch…bad girl punch. The poor coaches were out on the 100° field and dugout and never got any. And though it was hot as blue blazes up on those rickety bleachers we parents laughed, caught up with one another and cheered all the boys on. And yes, we got tanked. Back then that was what Saturday afternoons were for. After a few Solo cups full of “juice” no one cared about the steady stream of perspiration flowing from the top of their backbone down to their fanny! Katie’s father, Bob, one of the coaches, would take a big, old boom box and crank out baseball tunes between innings. Sometimes we sang. We had a blast! The coaches encouraged all the Little Leaguers, lifted them up and boosted their self-confidence even when mistakes were made. The boys adored their coaches. Never was there a happier group of people. We always gathered to pre-party and post-party when there were evening functions at school. Friday nights we’d potluck it, each family contributing to the meal. When school let out for summer we formed the 601 Club. Again, each family would contribute a dish or appetizer, sometimes booze, and we’d meet at the beach, across from Bahia Mar, at the grills, by the swings. We named it the 6-oh-one club when it was discovered that after 6p.m. parking was free on the beach. Our caravan pulled into the parking lot every Friday evening during summer. If it’s free sign me up! Whoever arrived first claimed two or three tables and a grill or two. The children ran and screamed in the waves. Often several of the children would build entire villages filled with sand castles. There was always an adult tossing a football, sipping beer or wine by a grill sizzling with burgers and dogs or passing out chips and salsa. All of us so appreciated and savored those enchanting evenings. There’s just something about the beach at night. The smell of salt water and the sound of the waves rolling in coupled with the moon transforming into a colossal pearl, its reflection shimmering away on the inky water is positively mesmerizing. 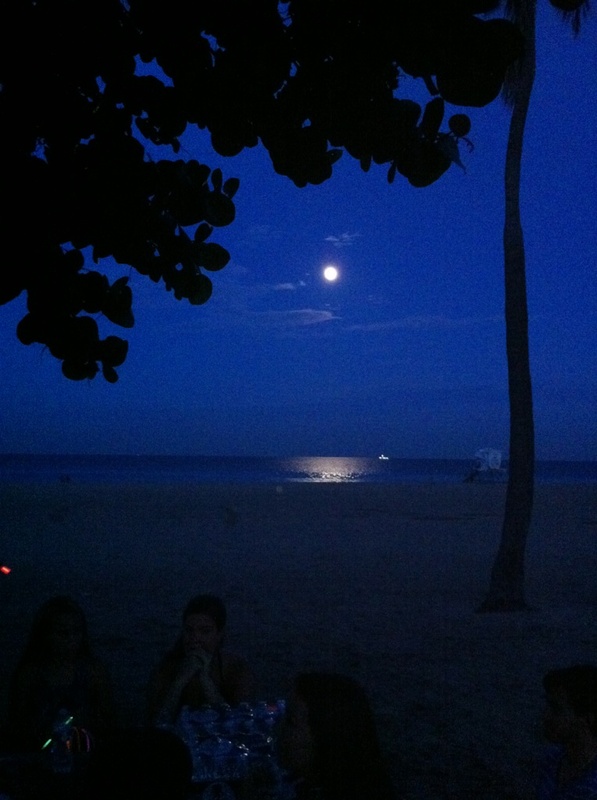 My favorite photo of Fort Lauderdale beach at night. The stresses of the week melted away as we slowly loosened up and let our hair down. This is where I discovered the miraculous world of frozen Whiskey Sours. One of the core moms, Harriet, showed up with a cask full of them and changed our lives completely. She’s from New Orleans and is accustomed to novel and exotic libations. We were nothing short of enthralled. If she gives me the recipe I’ll post it. Well, the years went by and yes, to a certain extent, we grew apart as our kid’s interests evolved, new friends were made, the children graduated and went on to college. Every now and again we’d run into each other, usually at the grocery store or Mass, but it wasn’t often. This past weekend though, we were reunited. If only for three or four hours the four core moms…Julie (who hails from the Keys and is mother of the bride), Suzanne (matriarch of FOUR darling boys and one spectacular girl), Harriet (Southern girl extraordinaire who single-handedly raised three incredibly gifted children after unexpectedly losing her husband years ago), and me (you know all about me, I think), were together again. What joy! What bliss! Yes, there were a few misty eyes every now and again, but way more high-pitched shrieks and good-natured laughter, whispered gossip from scandals past and, more than anything, hugs. Lots of hugs. We just couldn’t get enough of each other. Thankfully all our children are happy well-adjusted young adults, each up and coming in their chosen field and blazing their own trails. The bride-to-be glowed all afternoon and I believe her shower guests took delight in the festivities and got a kick out of us “older ladies”. I am so pleased and grateful I was included. One of my contributions to the party was this little pick-up. 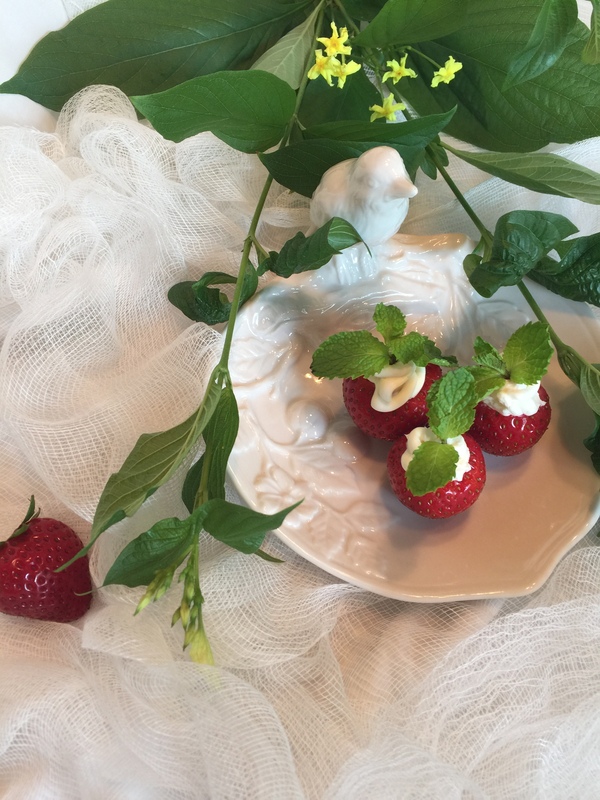 Ruby colored fresh strawberries, hulled and filled with sweetened cream cheese. They’re lovely, easy and luscious. In fact, this is one of the dishes I served at Suzanne’s baby shower when she was pregnant with Madeline. It’s a classic. One tablespoon of orange flavored Gran Marnier is wonderful in place of vanilla. Feel free to experiment with flavors. 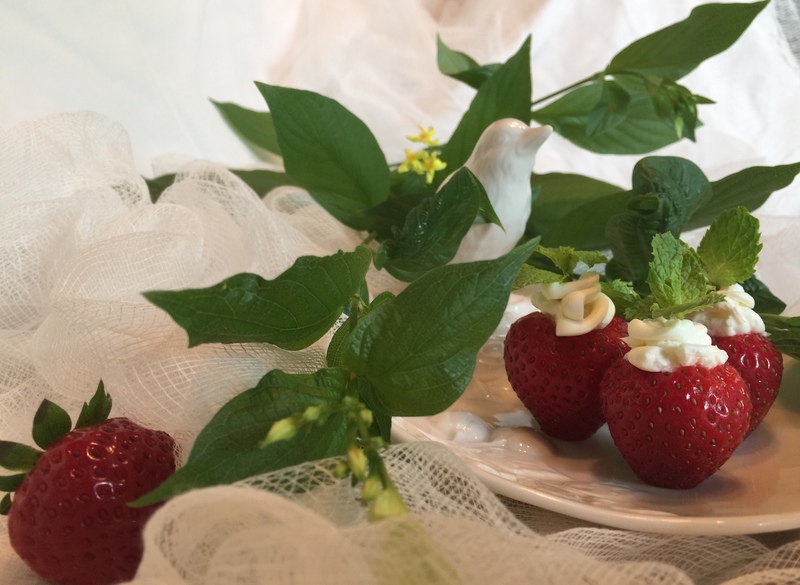 The filled berries I took to Katie’s shower were topped with toasted almond slices but fresh mint leaves also marry well with the fruit. Keep in mind this dish is absurdly easy but it’s best not assembled more than two to three hours prior to serving or your berries will become soggy. With a paring knife, trim a small piece off of the bottom of each berry so they stand straight up when served. Set aside. In a small bowl whip cream cheese until light and fluffy. If using a hand mixer beat 2-3 minutes. Add vanilla or liquor and confectioner’s sugar to cream cheese and mix until well combined. Transfer the cream cheese mixture to a corner of a gallon freezer bag. This will be your piping bag so use a heavy, freezer weight to avoid having the bag pop or break on you. With sharp scissors cut the tip (cut the size of a piece of confetti) off of the corner of the bag filled with the cream cheese mixture. 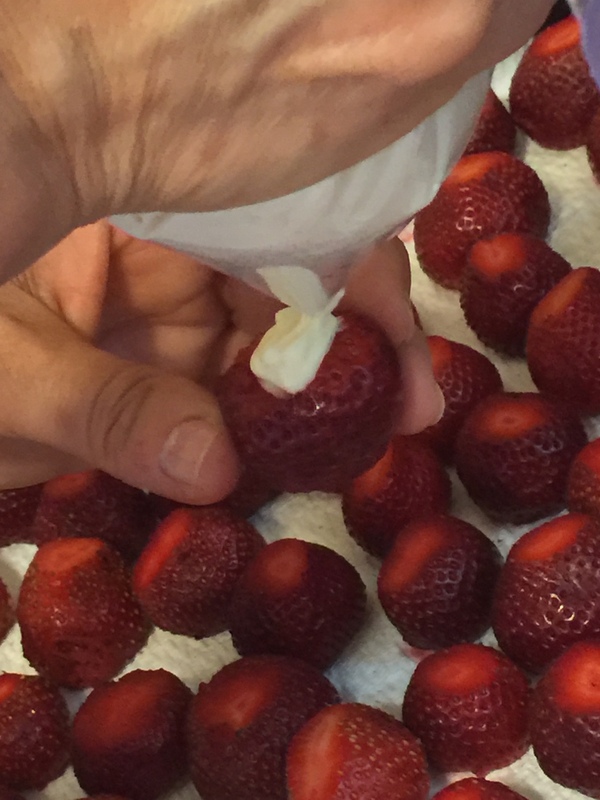 With the cut tip placed down in the berry squeeze the cream cheese into the strawberry until the mixture brims over the top of the berry. Top each berry with fresh mint leaves or sliced toasted almonds. Chill until serving. Serve within a few hours. Brown Butter Pecan Shortbread Cookies with a Bourbon and Brown Butter Glaze…whew! Thanks for this amazing recipe and the charming account of good times on Ft. Lauderdale beach. My family lived there (56 to 61) and delighted in all of Lauderdale’s tropical beauty. I graduated in 1960 from Stranahan HS there; we return to visit every chance we get……and, yes, we MUST visit that beach on sweet, southern nights ! !